RWKrafts: Unity Blog Hop with Faber Castell! Can you hear my high pitched squealing through your computer screen?! I'm beyond thrilled that Unity teamed up with Faber Castell for the entire week! They are two of my favorite favorite companies, so I had to join in the blog hop today! I really encourage you to leave comments along the hop today, and also leave comments on each of the Unity posts this week AND each Faber Castell post this week! Why? Ah-Maze-Zing prizes are to be won!! Now it's time for me to share my art journal page :) I used a healthy variety of both Unity stamps and Faber Castell Design Memory Craft products. I created a step-by-step photo collage to share my process in making this page. Now for the step breakdown! 1) Lay down some pattern washi tapes, tape the center of the spine, and place some dry wall tape. Cover with Faber Castell Gesso. Let dry. 2) Scribble a variety of Gelato colors over the page. Mist with water and blend Gelatos with your fingers. Let dry. 3) Use Faber Castell PITT Pens as 'ink' for your stamps. This is one of my favorite ways to add color to my stamps, because once the PITT Pen dries, it is permanent and won't bleed! 5) Use a palette knife to apply Whipped Spackle over a stencil. Let dry. 6) Stamp Donna's Poppies in Versamark ink and emboss with UTEE. I did this in 3 different areas. 7) Stamp your images and color with PITT Pens. 8) Stamp large 'true' sentiment and add 'stay' sticker letters. 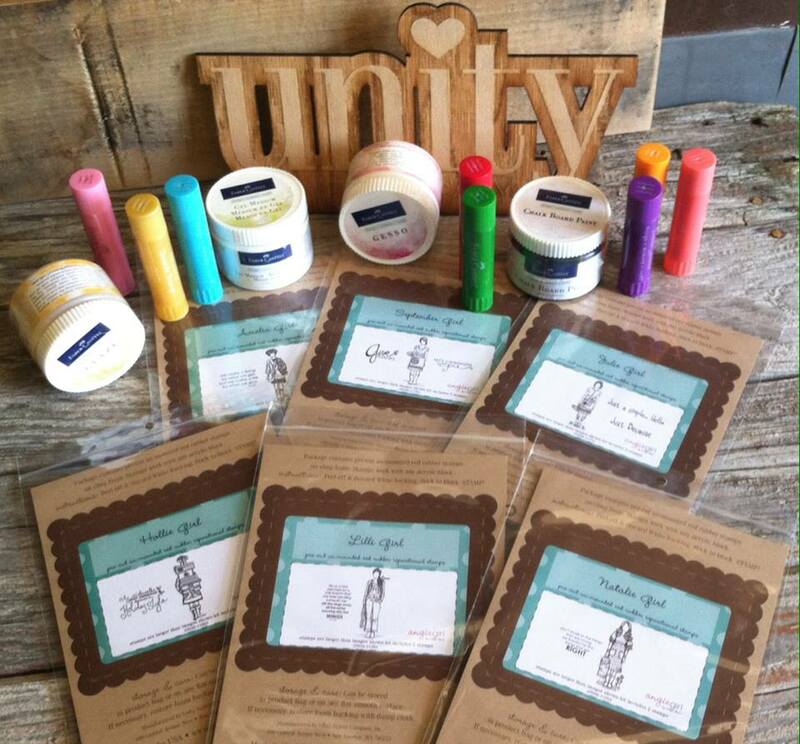 The Unity stamp sets I used are KOTM May 2014, SMAK May 2014, BIG Inspiration BIG Words, Donna Poppie's, Tumbleweed Houses, Create Your Day, ...And Then There was a Boy. This journal page was also created for the current Mixed Media Monthly Challenge! 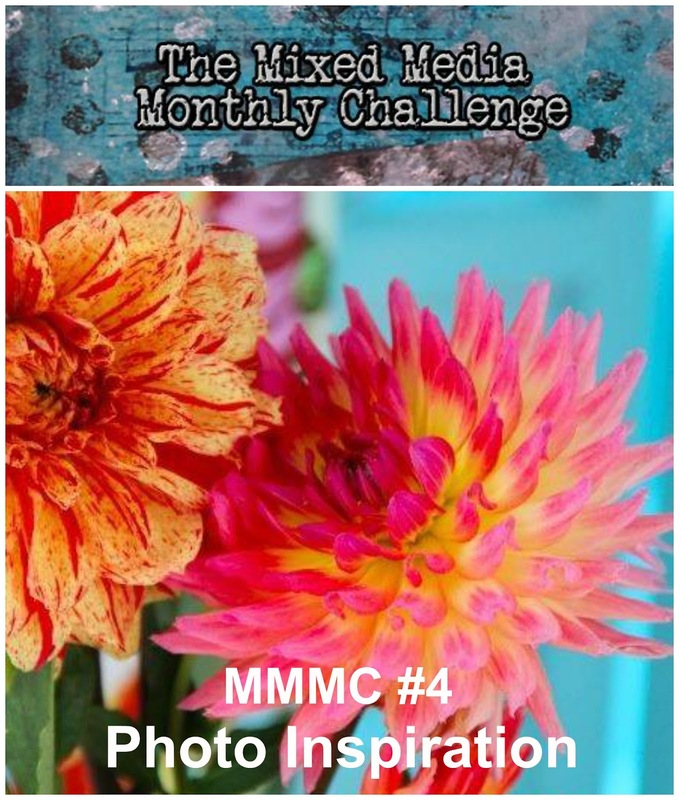 They have a gorgeous photo inspiration challenge this month, which inspired the colors in my page. 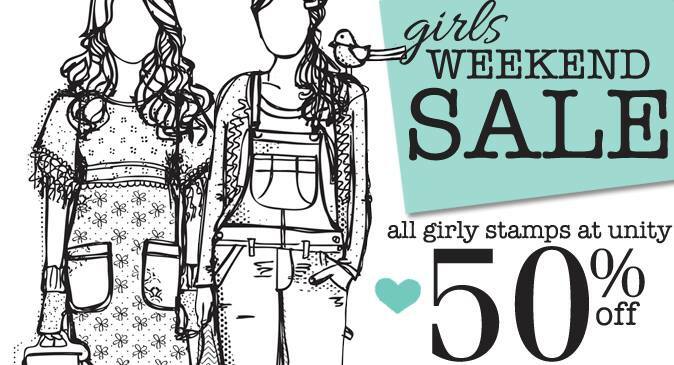 Now, it wouldn't be a Thursday without a brand new Unity Stamp Co sale, would it?! Plus a LOT of new releases that I know you'll love. Once you're finished leaving those comments, jump over to the Unity store to shop away! Cool messy and fun. Beautiful. Tks for sharing. Just an awesome page Rachel. Love your step-by-step tutorial. Stay happy. thanks for the pictures and instructions on making this page. It's free-form and fun. thanks for sharing a delightful page. Those background colors are so soft and pretty. Very feminine. Love it! Gorgeous project!! Wish you a very special birthday, Rachel! I am thinking of you and Pumpkin! Sending big hugs! OMG,this is so pretty, I love it. I love this whimsical page! Happy birthday to you! Thank you for all the close-ups. I love all the layers. Awesome page! Such a fun project....love the final results! Thanks for sharing! LOVE your art journal pages!! Pretty colors, awesome textures and I LOVE the stamp!!! Happy Birthday!! Beautiful journal pages. Love all the techniques. Beautiful project - love all the attention to the little details, especially textures! Love your mixed media style! You really added a TON of textures to your canvas! Awesome! this is totally incredible.. I love it.. very creative and oh so awesome..
You're so creative. Another awesome showcase with mixed media art. This is exactly how I love to use these products... I love that you shared a planner page,some great texture and design. Love your page especially all the texture. The colors are perfect for the challenge. Happy Birthday!!!!!! Sensational page. Thanks for the steps you listed. The page is so fun! I love it! Stephanie, so much texture, I love it! I finally got me some speckle and I'll be using my stencils for my next project!! Wow, awesome journal page!! very cool! great color combo and detail. Love! Great message and I like the colors and texture. Wow a phenomenal bunch of Unity stamps! love all the textures you created! Such cool textures, and the stamps you used were perfect for this journal layout! Great tutorial. Thanks for the inspiring uses of Unity and Faber-Castel. I love seeing new and creative ideas so thanks for having this blog hop! Thank you for the photo tutorial! I love this and the touch with the little houses in the corner is really cute! 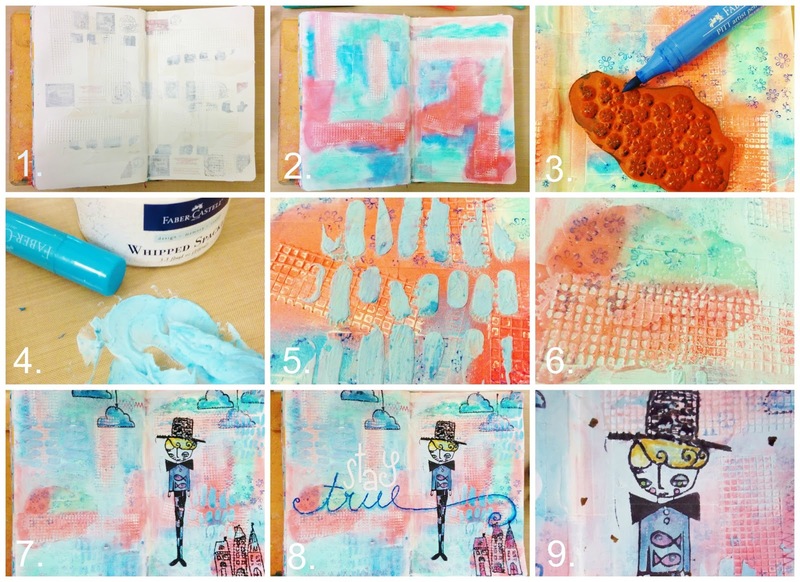 awesome art journal pages with great textures and colors! What a fun page. Love all the texture. I LOVE all the GORGEOUS colors and textures. Great tutorial. Thank so much for sharing! Such a good art journal page! Hard not to get inspired by this! Ahhhh-MAZING!!!!! Love it! Really hope that all this inspiration gets me out of my comfort zone more often! So much gorgeous texture!! I love this. Your journal page is amazing...loving all the texture! I just love how you wrote this post! I always like knowing how the artist made their artwork! Thanks for sharing! LOVE the GORGEOUS colors & textures, LOVE your sentiment and BIG TRUE, LOVE IT ALL, it is a STUNNING piece that you should frame & display!! !